Catalonia votes: Referendum YES! – Freedom for Catalonia! Last Sunday November 25th Catalan people finally voted in the plebiscite elections held to choose the members of the parliament of Catalonia. Despite the party I followed (SI with my favorite trio Mr. Alfons Lopez Tena, Uriel Beltran and Toni Strubell) were unfortunately beaten obtaining scarcely 46.093 votes, which involves they must leave the parliament, still the count of votes and seats support our country self-determination. Mr. Mas, now president in functions only, obtained only 50 seats in the parliament, losing 12 seats from the previous elections held in 2010. Still it is obvious Catalans have decided that our new government will need Covergència i Unió party leading. And the best news is that Esquerra Republicana de Catalunya has at last become the 2nd stronger force in the parliament, by duplicating their seats and votes from the previous exercise. Indeed Esquerra was the party I followed before but the corruption during Tripartit government times and the bad leaders they have had so far, made me start listening somebody else, who was precisely fighting corruption and openly claiming for independence: SI! Like my dear friend Victor Alexandre wrote a few days ago, it is true that during the two months of short political campaign for the elections, Si per la independència suffered a tough boycott. Mostly this is due as they have messed around with every single party that now is in the parliament, discovering to the eyes of Catalan society plots like Abertis and the road tolls involving members of CIU. Therefore I assume the other parties did not want them inside the parliament again whatsoever. I know Mr. Tena and Mr. Uriel will keep on fighting back from outside the parliament as they still rule some town halls in Catalonia, some of them have already defied the Spanish government by no paying them taxes. However, the reality is they will have to decide who from the elected new parliament they will team up with in order to have their voices heard in the chamber again. And for me the most sensible decision would be to team up with ERC, as they intended to do when elections were announced. Had they agreed with Mr. Oriol Junqueres then, they will for sure now be elected members of the parliament today. On the other extreme, I must remark that I have seen the ex-fascist Partido Popular desperately trying to dynamite the good reputation Mr. Mas and the Pujol family have by publishing false scandalous news in their media like El Mundo. Defamation is the only weapon the Spanish fascists can use against Catalan representatives today. But that is something we all expected, right? 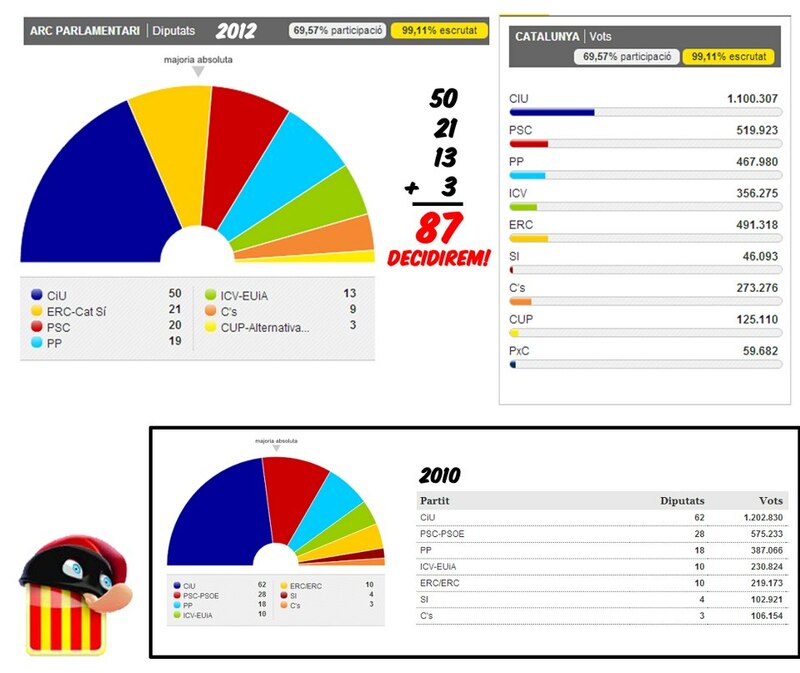 However, what is most surprising to me is dangerous increase of a party like Ciutadans, composed mostly by PP ex-voters. I say mostly since unfortunately for me I have some of my own family members who are openly supporting them, only because they are misinformed. As much as they are against corruption, the leaders of Ciutadans are corrupted themselves; therefore they are only taking advantage of the moment by doing harsh demagogy and manipulate the opinion of humble people at their convenience. And even although I support democracy and freedom of expression, I look forward the day we declare Catalonia’s independence and hope Ciutadans leaves the parliament by their own foot, together with PP. Now Mr. Mas and Mr. Junqueres are already having serious conversations as they both need one another to rule the Catalan government from now own and make independence from Spain possible. Everybody can see how many people from the left-wing parties live in Catalonia. My congratulations to the progressive Mr. Herrera from ICV along with the anti-system anarchist CUP (indeed one of my favorites too, as my grandma was an anarchist before the war with Spain during the 30ies); I hope both parties will defend much of the interest of the Catalan people from a social and economic point of view, as their voters are all working class people. As for the two major parties coming from Spain, PSC and PP are somehow surviving within the parliament, though the first one has lost almost half of the votes and the latter is unfortunately gaining few. Yet the question of a potential referendum has been properly defended. Ultimately the purpose of these elections was to see if Catalan people want a parliament that would vote in favor to have a referendum about independence in the next 2 coming years. And figures speak for themselves. At least 90 seats of the parliament will vote YES.